Approximately 24 hours prior to cooking turkey, make a flavorful marinade and inject it into the meat of the turkey. 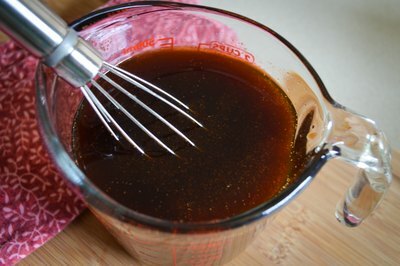 This marinade method will result in exceptionally tender turkey meat with a more heavily concentrated flavor, due to the fact that the marinade was injected rather than merely slathered on top. Prepare the marinade. Mix all the marinade ingredients together in the sauce pan. Cook and stir over medium heat until the ingredients dissolve completely and the marinade is well blended. Remove from the heat and let it cool down to room temperature. Remove the giblets and the neck portions from the inside of the turkey. Wash the turkey with cold water and pat it dry with paper towels. Place the turkey on a baking rack in a shallow roasting pan. 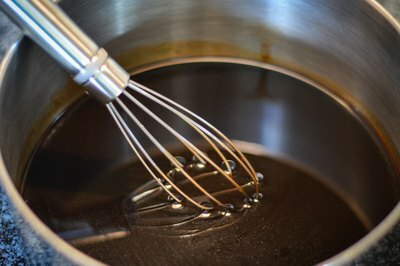 Whisk the marinade ingredients again to make sure they are well blended. 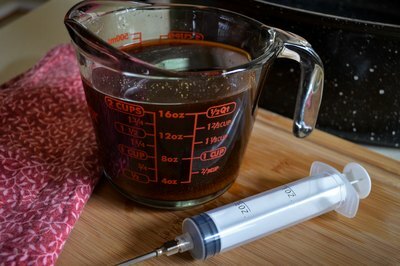 Fill the syringe by placing the needle into the marinade and drawing the plunger back on the syringe. The syringe will hold approximately 1 ounce of marinade. Insert the needle into the fleshiest portion of one of the breasts. 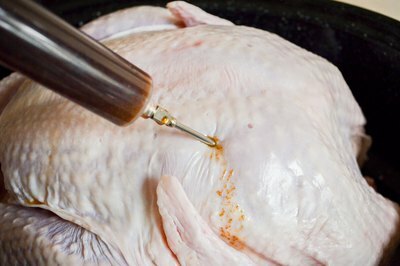 Push the syringe to inject part of the marinade into the turkey breast. Pull the needle back slightly and then place it back into the breast at another angle. Push the syringe to inject more marinade into this new area. Continue to reposition the needle and inject more marinade until the syringe is empty. Remove the needle. Repeat steps 4 and 5 in the other breast and in both thighs, both wings, the back and the drumsticks. 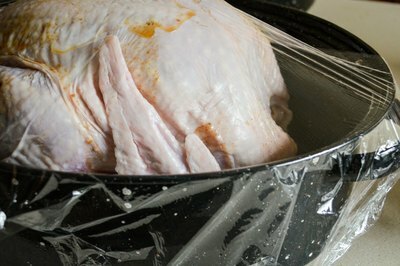 Cover the turkey with plastic wrap and place it in the refrigerator for approximately 24 hours before cooking. Make the fewest number of punctures possible into the turkey meat. More punctures will make the meat drier and less tender. 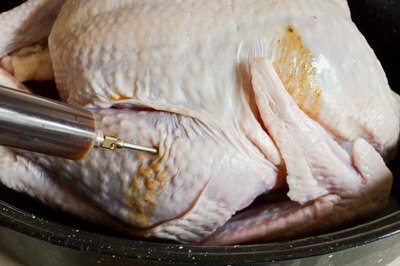 Never inject hot or warm marinade into a turkey. 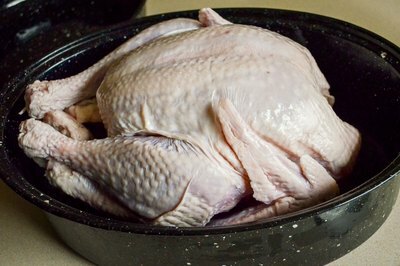 This can cause bacteria to multiply within the turkey and lead to food poisoning.